Conspiracy theorists have long heralded the coming day of one world governments and the like. And while this is an intimidating idea for some, it’s likely to exist in some form someday. We can make this prediction because universal currency already exists. Bitcoin has been one of the big finance stories of the past couple of years. The digital currency is already used by millions all over the world for web transactions. But the virtual money is becoming increasingly common for physical transactions, with Bitcoin ATMs becoming increasingly common to see. Bitcoin is an isolated example. While there are other e-currencies that have been created, none have been so widely adopted. It’s customer confidence that gives Bitcoin its value. You could say the same about the US Dollar and many other traditional currencies. 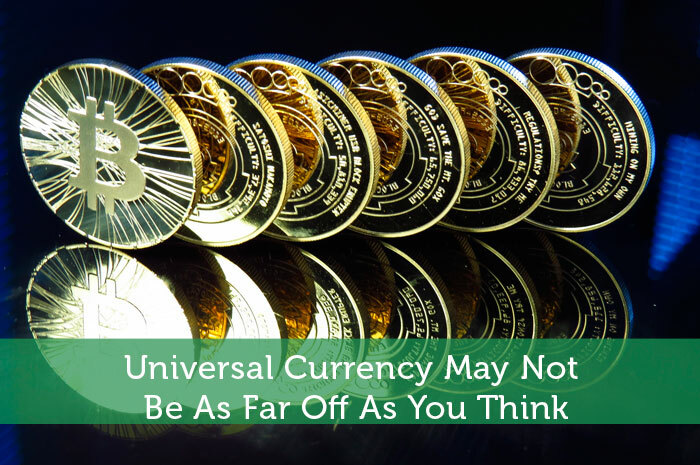 Not based upon any underlying value except the confidence of a nation’s citizenry, Bitcoin has harnessed this same principle to prove the currency can be nothing more than an idea, and that it can cross borders. Even traditional currencies are becoming more fluid than ever. The exchange of foreign currencies, often called Forex, happens at every level of society. Working immigrants send hundreds of billions of dollars from one nation to another each year. And at the highest level, international governments and banking institutions trade billions, swapping currencies in deals that have to become more fast and efficient every month. Currency fluidity is becoming more noticeable on the consumer in two main ways. Companies like AFEX have started opening up shops in major metropolitan areas. At these locations, people can walk up off the street and trade one kind of currency for any of dozens of others. This is a process that used to take days, or could only be had with poor exchange rates and high fees. The frequency and volume of this kind of transactions, which are happening constantly everywhere in the world, is forcing these prices down. Foreign exchange companies are evolving at a rapid pace, in digital and mobile environments. The other place consumers are starting to notice the way in which currencies are quickly traded one for another is in internet forex trading brokerage, through the process of spread betting. This is an entirely different kind of exchange. It doesn’t involve the actual trading of currencies, but rather piggy-backs on these markets. Users make spread bets, based on how one currency’s valuation will change relative to another. Good spread betters are able to anticipate the direction and amount of a specific currency’s value fluctuation, and receive winnings based on how much they wagered. With nation-less currencies being widely adopted, and traditional currencies becoming more fluid and interchangeable than ever, the promise of future borderless currencies seems all but guaranteed. This will have enormous ramifications for the wealth of nations, the transfer of wealth, the economics of geography, and countless other factors that make the world the way it is. And while these are changes that may seem hard to imagine, they are going to come faster than you think. Money drives the future more than any other man-made element, and it will continue to transform life as we know it, faster than you think.